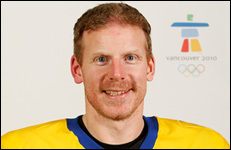 Daniel Alfredsson is a 14-year NHL veteran and the face of the Ottawa Senators. He attracted the hockey world’s attention with his 1995-96 debut, capturing the Calder Memorial Trophy as the league’s top rookie and establishing himself as one of the NHL’s most talented wingers. Averaging close to a point per game throughout his career, the skilled Swede is now Ottawa’s all-time leading scorer with 992 points in 1002 games. A true professional and respected team leader, he was named as team captain in 1998-99 and is now the longest serving leader among active NHL Captains. His peers across the league also acknowledged his leadership skills, voting him as NHLPA Vice-President from 2002-2007. In International competition, Daniel has represented Team Sweden in 13 major International events, highlighted by an Olympic gold medal in 2006. One of the best European players in NHL history, he is one of just 22 European Players to play in over 1,000 NHL games.